Enter through the discrete door in the heart of the old town and it’s as if you’ve walked into a dreamy oasis of overgrown greenery and stone. You’re host is Theo Maniatis who has created this welcoming and (surprisingly) relaxing setting for a memorable dinner. You get the sense that this is one of those iconic places where local celebrities have visited over the years thanks to all of the kitschy photos that adorn the walls, and given how quickly it filled up, reservations are a must. 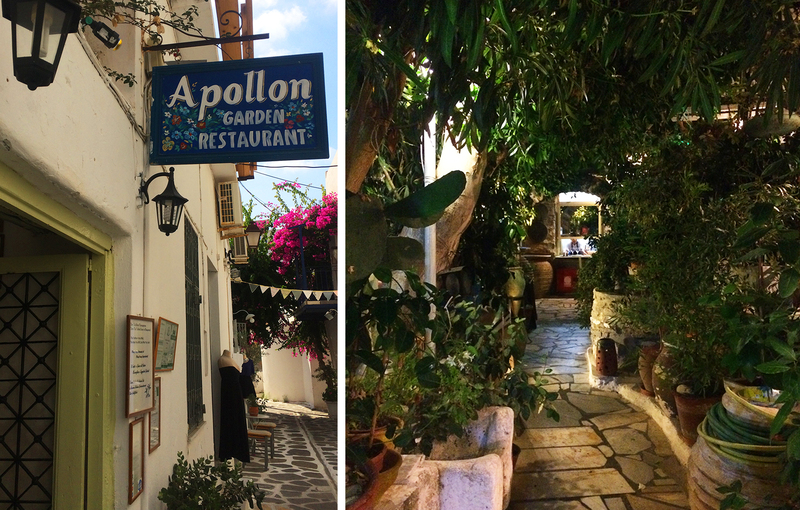 The only thing better than the atmosphere at the Apollon Garden was the food, its menu comprised of a tempting list of traditional Greek dishes that made it almost too hard to choose (almost). 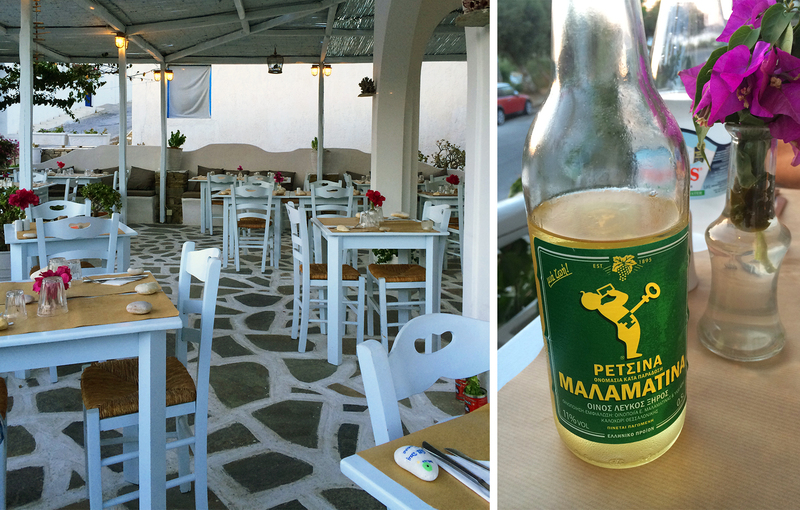 Upon ordering a carafe of house white wine, were brought a plate of bread and olives, which Mr. Maniatis proudly informed us were from his hometown in Sparta. 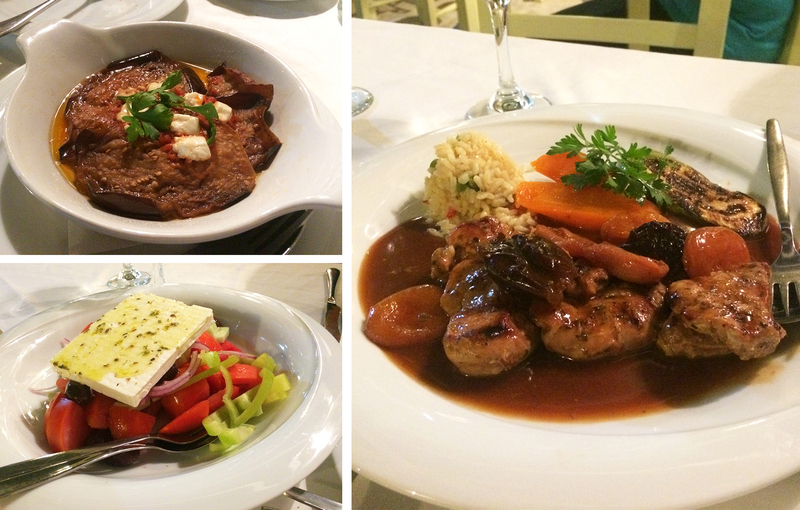 We started our meal with a Greek salad and a roasted eggplant and feta appetizer, which was followed by a pork fillet prepared with dried apricots and figs in a Mavrodafni wine sauce to share. Mr. Maniatis almost swiped our empty plate before my husband had a chance to soak up the last traces of the delicious sauce with a piece of bread, to which he apologized and said, “Ahh, you’re just like Greek” with a wink. It was yet another example of the welcoming service we experienced from top to bottom at this seemingly hotspot for locals and tourists alike. 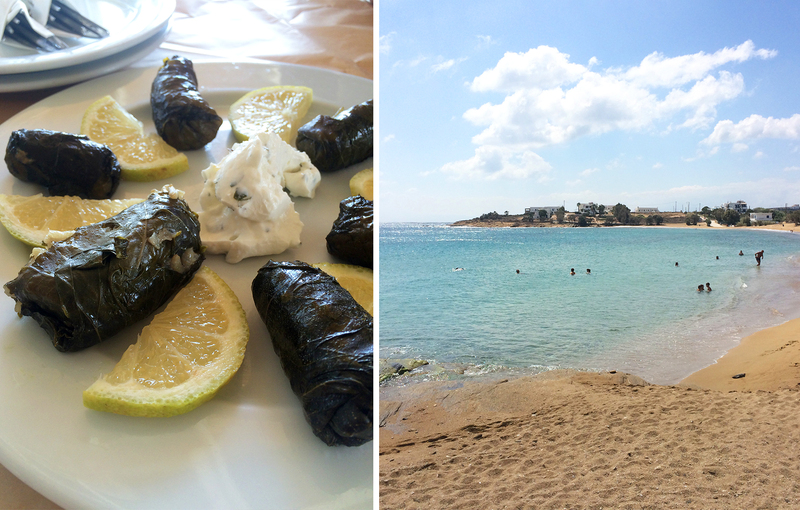 Also in Parikia, Trata is a family-run fish taverna and ouzerie located just up the main road from the port. 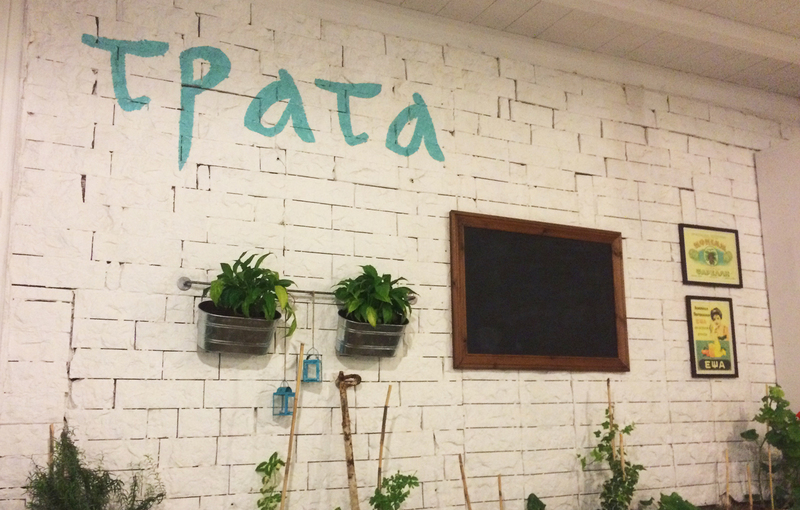 The restaurant’s adorable atmosphere drew us in immediately, like a little garden patio painted bright white with turquoise accents and decorated with hanging plants and flower boxes in big windows that opened up to a view of the sea. We scoped out the menu earlier in the day, which included a wide variety of traditional dishes rooted in the “recipes of their parents” with attention to fresh, local ingredients. Our waiter was warm and genuine, taking the time to explain elements of the menu while showing us a plate of that day’s seafood specialties, pointing out which were caught locally and which were brought in from other nearby islands. We ordered our now-routine house white wine and ouzo, which was quickly followed by a warm-out-of-the-oven loaf of bread encrusted with smoky sesame seeds. Shortly after came the rest of our food, a parade of plates that included a Greek salad (another beloved routine), roasted green peppers with feta (despite their appearance they were pleasantly mild), chickpea soup baked in a ceramic pot (a specialty of the house) and grilled octopus (one of the local catches of the day). Our meal concluded with a slice of chocolate and cream layer cake for dessert, compliments of the house, which was light and sweet and the perfect ending to another wonderful dining experience in Paros. Take the bus from Parikia 20 minutes north to Naousa, a former Venetian fishing village where you find a handful of tavernas lining its picturesque port and other hidden gems a little off the beaten path. Karina All Day Taverna fell into the latter category, a quiet retreat away from the more touristy area with a beautiful open-air patio. We were served by the owner Karina, who sweetly guided us through the menu and that evening’s specials as she placed rocks on the corners of our table to keep its brown paper covering in place. 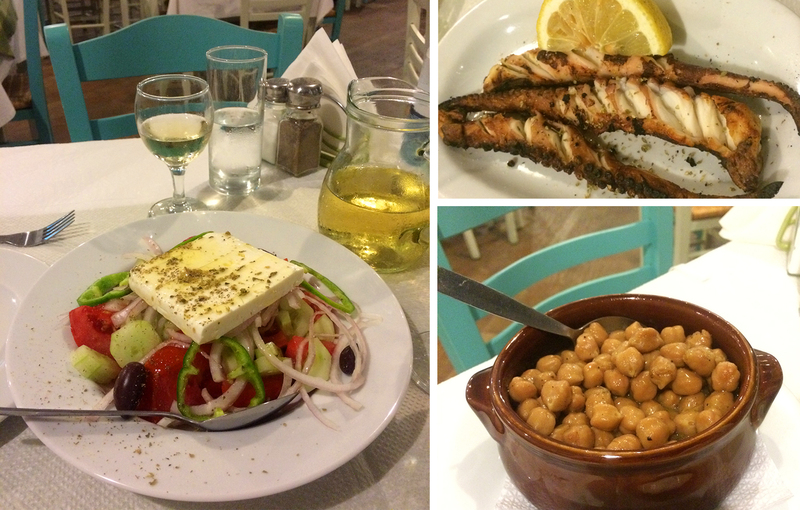 Our meal started with ouzo and a small bottle of Retsina (a Greek white wine with a piney taste), tomato bruschetta and a Greek salad. 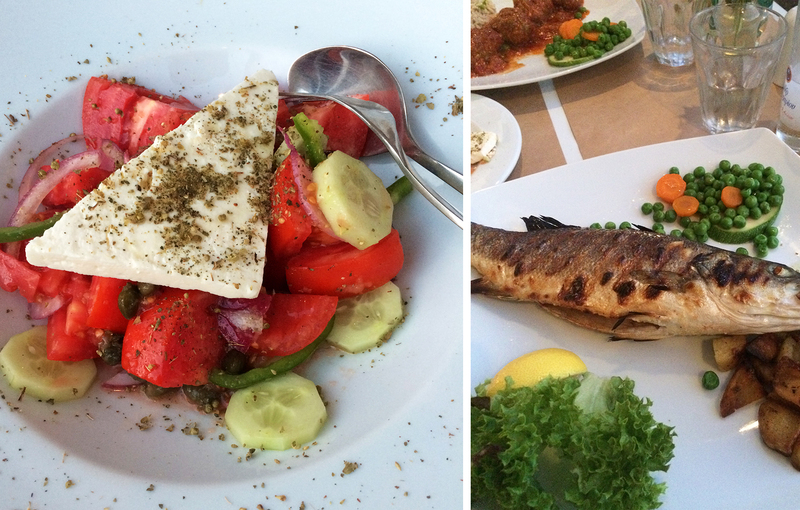 Next came a plate of meatballs baked with feta and grilled sea bass. We were slightly unprepared for the whole, boned fish that appeared, so it would be to your benefit to learn how to properly debone a fish (if it’s not a skill you’ve already mastered) to avoid unpleasant surprises. Karina kept an eye on us from a table in the corner where she ate her own dinner and chatted with a friend who stopped by to visit. When we were finished eating she brought us a glass of Mastika, a liqueur made from the gum of the mastic evergreen tree that is also used in granule form to make sweets. Its earthy, juniper taste complimented the plate of watermelon and honeydew that accompanied the after dinner drink. Afterwards we spent some time wandering through Naousa’s narrow whitewashed and stone-paved streets, happy to find that many shops were open late and the port area alive with others enjoying the night.